When you need full color flyers or sell sheets, look no further. We regularly produce cost effective high quality sell sheets and flyers using our direct-to-plate (210 linescreen) printing process. Unlike many printers, our printing technology offers you beautiful full color printing for less and 24 hour printing of sell sheets and flyers is no problem for Solutionsink. 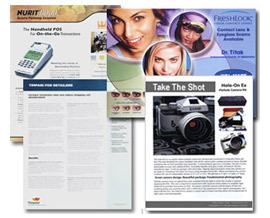 Also referred to as product sheets, we offer additional discounts for ordering more than one lot at the same time. 1. Select options for your sell sheets and flyers. 2. Add sell sheets and flyers to your list. 3. Add any additional items. 4. Request quote when finished.